Sometimes you just have to break down the walls. There are walls everywhere. Some are mobile and go 70 miles an hour in rush hour. Others are tiny and whiny and somehow live in the same neighborhood as your kids, want to eat all your food and mess up your house, play all your video games, then leave without a care in world, only to come back when it is most inconvenient. So how is it that we handle walls? On a daily basis we have to decide. Almost all of the ways are work. Sometimes we climb over them, other times we go around them, sometimes we even dig below them. Most of the time, I use the subtle and dark wizard method of exploiting the walls weakness. If you look close enough and study hard enough, every wall has its weakness. It may be time consuming, but it is the most satisfyingly bitter way to take down the wall. One loose brick, and it all comes crumbling down. Or you can take the not so subtle approach, and get a sledge hammer and knock it the crap down. That might cause the wall to break down, but it might also cause you to break down. And that involves a lot of crying and messiness and no one has time for that. Speaking of breaking down, my cars often do. Back in the day, more often than not because they were used and abused and mistreated…by the previous owners of course. I never slammed on the brakes from inattentiveness, or boredom, or sleepiness. And how dare you accuse me of ever speeding. I always left at least 5 minutes early for a drive that was 20 minutes away. 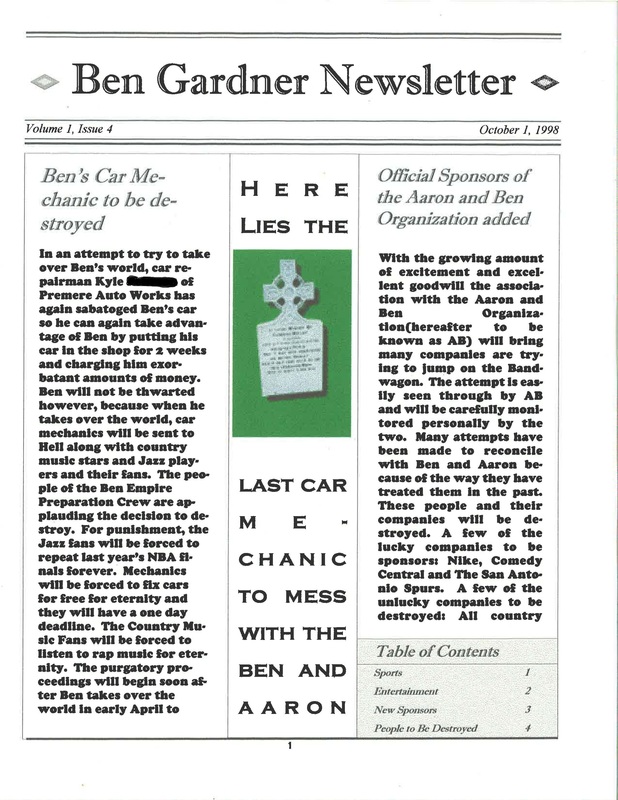 Well, back in 1998, somehow my car was feeling ill and needed to go to a mechanic. There was one near by, that did it for really expensive, but there was a catch. It took him at least two weeks to get to it. And I had all kinds of time, just like I do now. Who needed a car, when I could walk 6 miles to anything convenient? So, of course, I brought my rust piled bucket, loosely attached to four wheels to Kyle, knowing that he would ignore my car lovingly and let it sit in comfort in his poorly lit and I’m sure completely secure garage, where he would give me updates every day of other cars that he was working on. Find out what will happen below in The Ben Gardner Newsletter, Volume 4. Because who wants something that goes really fast, that is necessary to get to work on time every day, to get done quickly. After an experience I had this weekend with an unreliable gutter repairman, I think it would probably be fitting to send all people in the fixing things profession to hell. It’s like they want revenge for having to work on all our stuff and taking so much of our money. Oh I’ve seen even better ones involving Spiders and such. But this one was pretty good. When it comes to stealing money from me, mechanics are the smartest. They could make up 50 new words that meant they were going to change the spark plugs, charge $1000 and I would be none the wiser. No way. There is no trolling here. Except for the ones under the Bitter Bridge. The bridge that leads to the land of Bitterness, sour milk and bee filled honey. The land of internet trolls. I would like to ask you country are you posting from? Bitter Seattle, Washington, USA, Earth.